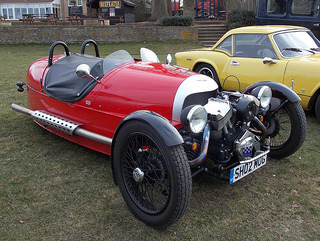 The Morgan 3 Wheeler sports car. 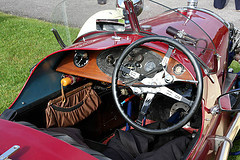 The founder of the Morgan Motor Company, Henry Morgan, introduced the single seat Morgan Runabout which was, in essence, a lightweight chassis and body onto which was added a powerful motorcycle engine. This three wheeler, introduced in 1910, was subsequently classified as a Cyclecar. Although he initially presented both a single seat and two seater version of his Runabout at the 1911 London Motor Show, he was in no doubt, following the exhibition, that the two seater model would receive greater demand. Interestingly, it incorporated a two speed gearbox without a reverse gear. 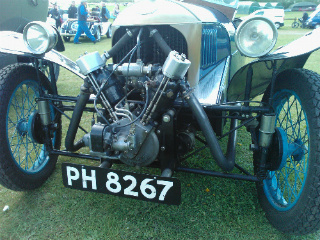 The most common type of engine used was a JAP, V-twin, although others could be fitted. 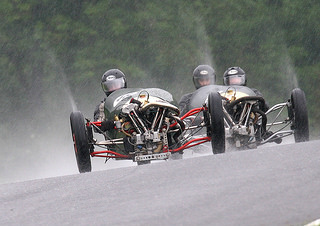 The Morgan three wheeler quickly went on to be entered in various forms of motor sport, in particular at the Brooklands racing ciruit. By 1914, Morgans had notched up a number of world records for different classes of Cyclecars, including victories on the race track. 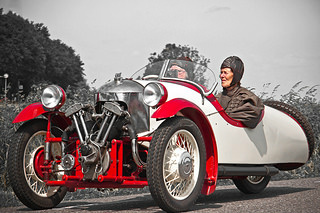 An important milestone was when a Morgan three wheeler won the International Cyclecar Grand Prix in France. Based on this winning car, a new model, called the Grand Prix, was introduced into the Morgan range, and was built during the period 1913 to 1926. 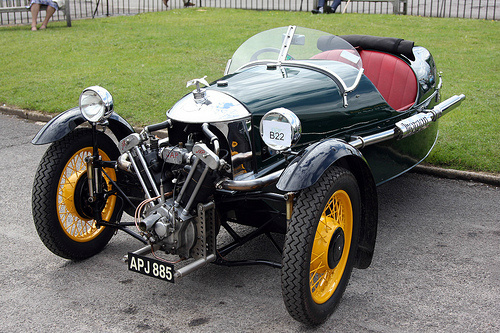 The WW1 flying ace, Albert Ball, purchased a Grand Prix with a modified body, and this gave rise to the addition, in 1920, of a new sporty three wheeler, called the Aero. 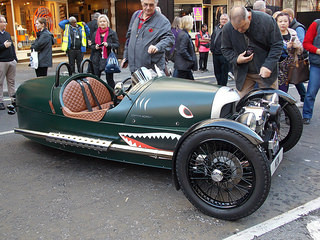 Later, a Runabout version containing four seats was introduced, which was subsequently fitted with front wheel brakes. In the late 1920's, subsequent to the many successes achieved on the race track, the Super Aero was launched, with streamlined body panels. This model turned out to be successful, both on and off the track. In 1930, the racing driver, Mrs Stewart, travelled at over 100 mph in a Morgan sports car, on a race track near Paris, and duly exceeded the One Hour World Record. In 1931, the previous two speed transmission was replaced by a gearbox containing three forward gears, and one reverse. With engines now supplied by Matchless, a new high performance version of the Super Aero was introduced, called the Super Sports. Both the Aero and Sports models used either air cooled or liquid cooled engines, which were adaptations of the Matchless motorcycle engine. These engine were positioned in front of the front wheels, on a steel tubular chassis. In 1933, a new model was presented at the London Motorcycle Show, and was designated the F-Type. The F-4 had a four seat body on a new steel chassis, and was powered by a Ford side valve engine, as used in the Ford Model Y saloon. In 1935, the F-2, a two seater model, was added to complement the F-4. Furthermore, in 1937, a more sporty version, designated the F Super sports car, with wings and a louvered bonnet, was introduced. 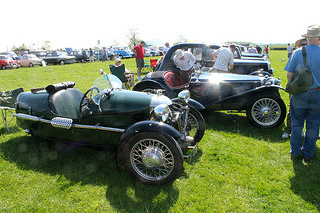 These Ford powered three wheelers remained in production until 1952, and turned out to be one of Morgan's most successful range of three wheelers. 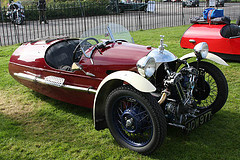 In 1936, the first four wheeled Morgan, designated the 4-4 Series 1, referring to the fact that it had four wheels and a four cylinder engine, was launched, and signalled the beginning of the end for the three wheeler. However, the F-Type was still manufactured, primarily as the four seater F-4 and the two seater F Super sports car. In 1946, the final batch of twelve, V-twin three wheelers were produced, and exported to Australia. On the other hand, the F-Type continued to be manufactured, on the same production lines as the 4-4, with export being given priority. Unfortunately, export sales slowly began to decline in the face of demand for four wheeled models. Consequently, in 1950, it was decided to phase out production of the Morgan three wheeler sports car, with the last unit being built in 1953. 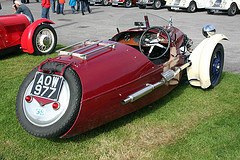 In the UK, three wheelers were classified, for taxation purposes, as motorcycles, and as such were exempt from road tax. 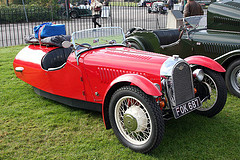 Although this was an attractive proposition, it was not sufficient for Cyclecars to withstand competition from economical and more comfortable small cars, such as the Austin 7. 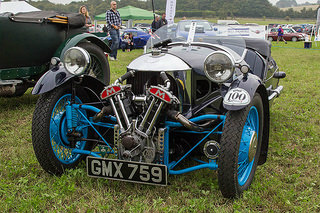 As fate would have it, the Morgan three wheeler turned full circle and, in 2011, was reborn, sporting a modern V-twin engine, together with other technological advances. 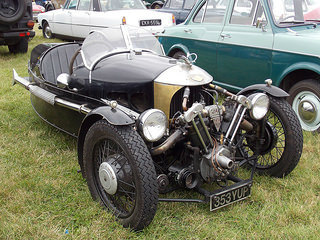 A 1939 original Morgan Three Wheeler, in excellent condition, would fetch in the region of £40,000/$64,000.